The growing impact of climate change and variability take a heavy toll on the poorest in developing countries and countries with emerging economies. Extreme events such as heavy rainfall, long-lasting droughts, frost or hail lead to crop failures in Peru again and again. If farmers receive the right climate forecasts at the right time, they can take measures to protect the crop. This is why in 2012, the two national weather services SENAMHI Peru and MeteoSwiss joined forces in the Climandes project, an initiative that provides reliable and user-tailored weather and climate services to the agricultural sector to promote food security and poverty reduction. 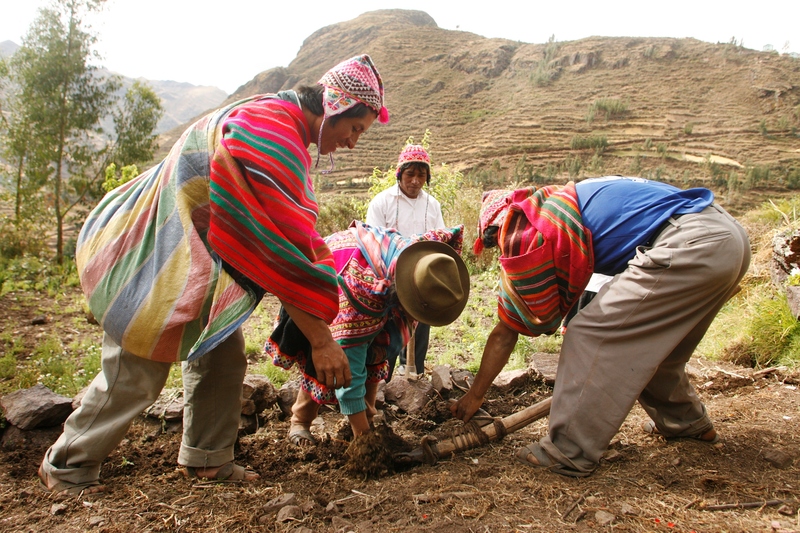 The project runs until March 2019 and allows experts from these two mountainous countries (Peru and Switzerland) to work together to provide high quality climate services and establish a user-dialog to meet the specific needs of Andean smallholder farmers. Ultimately, this initiative offers a pilot example on how such services can benefit climate-sensitive sectors and, hence, society at large. The twinning of the national meteorological services SENAMHI Peru and MeteoSwiss is supported by the Swiss Agency for Development and Cooperation's (SDC) Global Programme Climate Change and Environment and coordinated by the World Meteorological Organization (WMO) under the umbrella of Global Framework for Climate Services (GFCS). Module 1: Development of climate services tailored to the needs of the agricultural sector in the Andean region. Module 2: Enhancement of training in meteorology and climatology. Module 3: Establishment of a User Interface Platform and demonstration of the socio-economic benefit of climate services. A key pillar of Climandes is the systematic identification of users' needs. Other important pillars for generating reliable forecasts are the introduction of systematic data management at SENAMHI and the improvement of meteorological and climatological training at the professional and university level in the Andean region. Climandes is developing climate services tailored to the needs of agricultural sector stakeholders. A prerequisite for such services are high-quality climate observation records. For this purpose, SENAMHI and MeteoSwiss have worked to enhance capacities in data quality control and homogenization (removal of non-climatic influences) procedures at SENAMHI. An in-depth understanding of farmers’ needs and requirements is indispensable to tailor climate information and thus provide climate services that are meaningful to Andean smallholder farmers. Climandes bridges the gap between these users and providers of climate services through an ongoing dialogue. This participatory process supports the development, dissemination and application of climate services. ​Weather forecasts and warnings are now sent via the local radio or SMS to small farmers in the Andes in their local language. In addition, Climandes informs policy-makers at the national and regional level about their return on current and future investments in climate services. To further improve knowledge for better climate services, SENAMHI and MeteoSwiss have developed specialized trainings in meteorology and climatology to meet current and future needs for climate services. The WMO Regional Training Center in Lima, hosted by the National Agrarian University La Molina promotes and offers these courses to countries in the Andes. E-learning has been established as a teaching resource at SENAMHI and embedded in the WMO Education and Training Programme. Student exchanges within the region as well as between Peru and Switzerland further support the development of capacities in meterology. Find out more about Climandes here.